It took the club 11 tries, but the Class A Lakewood BlueClaws finally won a home opener on Thursday night. Behind solid pitching from lefty starter Mario Hollands, Tyler Knigge and Eric Pettis, the two-time defending South Atlantic League champions locked down the 2-0 win over the White Sox affiliate, the Kannapolis Intimidators. The offense for both teams was minimal, but Lakewood first baseman Jim Murphy got the 'Claws on the board in the 2nd inning, when he led off the frame with a deep drive onto the left field berm off of Kannapolis right-hander, former Monmouth University stand out, Ryan Buch. "Our pitching was the story. And obviously, Murphy coming up with a big hit, in his first at bat, just to get us on the board was key," said first-year BlueClaws manager Chris Truby. 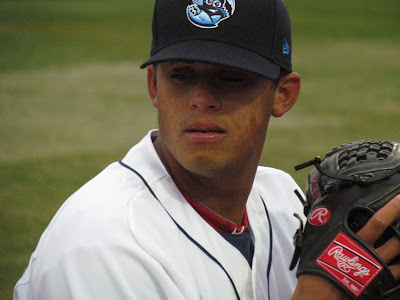 On an evening that began with the raising of the team's second straight title banner, the BlueClaws didn't get their second hit of the game until the 7th inning when third baseman Jeremy Barnes led off with a single and later scored on another single by 18-year-old outfielder Domingo Santana. "It was a slow start offensively," Truby said. "I think that's to be expected a little bit. Maybe some of the players had some first game butterflies and what not, but it's good to get the first one out of the way and walk out of here with the W."
Truby, who played in the Major Leagues for four different teams previously managed most of the players on his roster when they came through short-season Williamsport, where Truby was the skipper during the past two seasons. Hollands, a 22-year-old lefty hurler, tossed 5 scoreless innings, scattering five hits and striking out three en route to the win. Last year's 10th round draft selection by the Phillies was excited to help the BlueClaws end their home opener winless streak in front of 6,598 fans at FirstEnergy Park. "It was beautiful seeing all the fans out there and such a large amount of them. It makes it easier to pitch with that behind you," Hollands said. The California native, Hollands, stressed the crisp 48 degree temperature as a potential reason that the bats stayed cold throughout much of the contest. "I think (the weather) effected everyone. It was pretty damn cold out there, but we did just enough and the defense and pitching took care of things," Hollands said. Knigge (pronounced Ka-NIG-ee) and Pettis each tossed 2 perfect innings in relief. Pettis, who earned the save, will share time closing games early this season with two other right-handers, Juan Sosa and Chase Johnson, according to Truby. Murphy, a 17th round draft pick by the Phillies in 2006, helped the BlueClaws win the SAL title in 2009, but returned to Lakewood this year after struggling and posting a .239 average in 115 games with High A level Clearwater last season. Happy to be contributing, the 25-year-old hopes to enjoy success with the 'Claws once again and use that to propel himself back upward in the organization. "I kind of had a down year last year, and my goal coming in was just to play another season. I didn't care where it was. I didn't think coming back here was (a possibility), but I am happy to be here, back in Lakewood. It's a fun city to play in, with good fans," Murphy stated. "I just want to come out here and bang, and hopefully move up." The BlueClaws and Intimidators go back at it, continuing their four game series, on Friday night, as last year's 7th round draft pick righty David Buchanan takes on the White Sox' 2nd round pick from 2010 right-hander Jake Petricka at 7:05pm. Triple A Lehigh Valley recorded a 7-2 win at home over the SW-B Yankees. Jeff Larish and Delwyn Young each blasted homeruns for the IronPigs while Vance Worley struck out 9 batters over 6 shutout innings to earn the win. Brandon Moss went 3-for-4 as the designated hitter for the winners. In his Double A debut, righty hurler Josh Zeid took the loss as Reading fell in Portland, 4-3. Tuffy Gosewisch jacked a homer for the R-Phils while Freddy Galvis drove in 2 runs, in the losing effort. High-A Clearwater won their opener by a score of 10-1 over the Dunedin Blue Jays. The Threshers were led by top pitching prospect Jarred Cosart, who allowed just 2 hits over 6 innings, but the standout in the box score was converted pitcher and former top Phillies draft pick Joe Savery, who went 4-for-4 with a walk as the designated hitter.